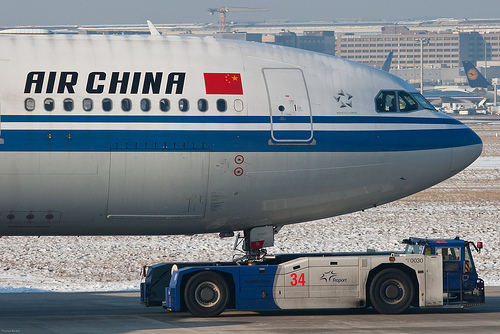 Air China starts the first flight to Addis Ababa, capital of Ethiopia on 3rd, Nov, 2015. It is the second destination of airlines in Africa, after the flight to South Africa. With this new route, Air China will make thrice a week flights between Beijing and Addis Ababa. The launching flight of the Airline with Airbus A330 was accorded warm welcome during its landing at Bole Airport by officials and staff members of the Ethiopian Airports Enterprise, the Ethiopian Airlines, Air China and also diplomats among others. The new route of Air China between Beijing and Addis Ababa came few days after the launch of maiden flight between Beijing and Johannesburg in South Africa few days back. With the increase of exchanges between the two countries and with the increase of investment by Chinese companies in Africa, more and more Chinese people are coming to Africa. So this flight is regarded as a remarkable sign of the flight-development of China.